is different, and electrons in fact inhabit regions of space known as orbitals. Orbits and orbitals sound similar, but they have quite different meanings. Thus with this seemingly inoffensive remark, Clark seemingly disintegrates Bohr’s planetary model in one fell blow. Bill: So what is an orbital, Professor Clark? Bohr’s old planetary model in which electrons orbited the nucleus. Yeah! atom? Is an orbital a physical object? we can mathematically find an electron. orbits and construct an orbital with them. around a bowling ball -- we are constructing each orbital with strips of film. Isn’t this like building an orbital with Mighty Mouse’s contrails? scrap it altogether. Think of an orbital as an energy band. region become an energy band that now forms a bond with another orbit? another water molecule via hydrogen bonds. material. You should perhaps start at a lower ‘energy level’, ha, ha, ha. chemistry class and here I end up by mistake in your metaphysics lecture. no such physical object such as an ‘energy band’ that can physically interact and form interfaces with physical objects. we instantly conclude without even doubting that we have before us an invisible physical object. invisible physical object and a ghost or a spirit. and you can't stop her. The orbital obviously works in reverse. You touch it with your hand, but not with your sight. orbital made of if not of electron bead 'orbits', energy, or fields? 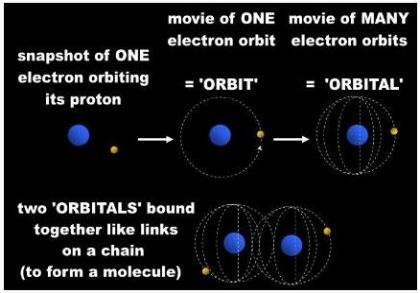 Is an orbital a region where we can find an electron? different than his mentor's (Fig. 2). change the direction of the jets! J. Clark, Atomic orbitals (2004) and Orbits and orbitals (2006), Chemguide. Bohr had his electron orbiting a nucleus. consists of two interlinking rings. energy levels, fields, or whatever. (whatever that is). We just have to figure out now what an orbital is and is made of. Module main page: The Quantum electron: a bead, a ribbon, AND a cloud all in one!